Do you feel that your day is out of control before it even begins? And these days, it's crazier than ever because of all of the emotions you're going through surrounding divorce, not to mention that your life is completely turned upside down? 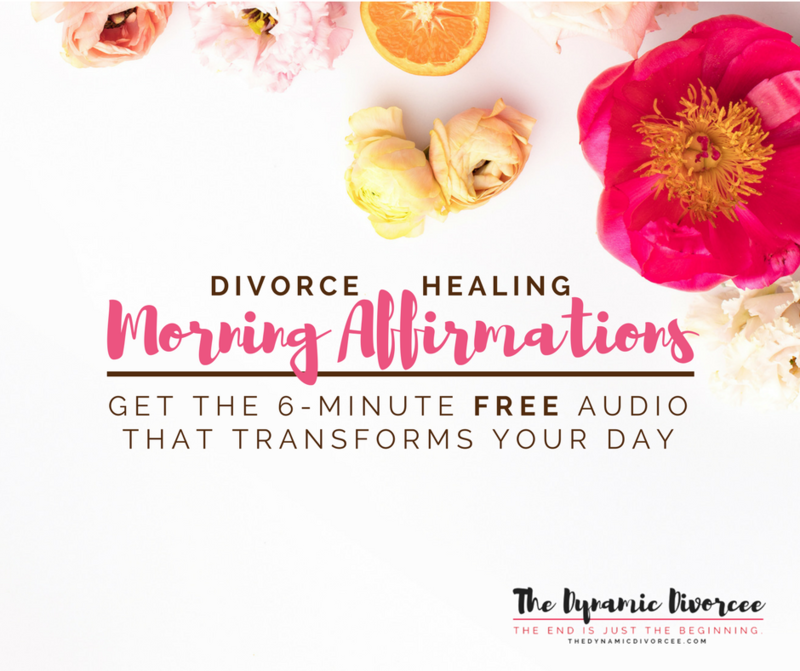 If mornings are especially tough, check out my Happy Morning Routine: Divorcée Edition for some wonderful ideas you can try, and, of course, try this audio. Before listening to the audio, please take a few deep breaths. Mentally scan your body to see where you are holding tension, and wherever you find that tension, breathe into it and let go. This meditation will speak to you in the “I” form, as if you are leading yourself through the process. At one point, you’ll be prompted to look within and to ask for inner guidance for today. There will then be a few moments of silence for you to sit quietly and see what thoughts and images might come to you as inner wisdom -- advice or encouragement for the day ahead. Then, you’ll receive the prompt to set an intention for what today will hold for you. See if an intention for the day comes to you. If you didn’t feel that you received any inner guidance in the previous step, take this time to consciously envision how you want your day to unfold, in the best possible way. Your intention could be something general, like “happiness” or “peace” or “coping well,” or it could be very specific -- your intention on how you would like to deal with an event that’s coming up today. Again, there will be a few moments of silence to see what comes to you. Next, you’ll be asked to create an affirmation based on your intention for today. The affirmation is a phrase you’ll use to recenter yourself throughout the day. It's a phrase that helps you remember and "affirm" how you consciously intend to experience your day. It’s a few words that feel powerful to you, and that support your intention about how you want to live and how you want to be. Finally, there will be a few moments of silence in which you are asked to repeat your affirmation to yourself several times. Your affirmation should feel encouraging and wonderful to you. If you don’t like the way it feels, go ahead and change it until it feels just right. It’s likely that your inner guidance will be a little bit different every day, and that your intention and your affirmation will change, too. If you do this meditation every day, you’ll find that inner guidance will come easier for you each time, and that encouraging words of self-affirmation will automatically come to you without thinking. The last few moments on the audio guide you through the process of handling negative experiences and people who may be part of your day today, and remind you that you have the power to magnetize to yourself the kind of day that you want to have. I hope you enjoy this time to focus your morning and your day. Please leave your feedback and comments! I love to hear the positive, and I also love to improve my offerings by learning what didn't work for you. I also made a DIY Morning Affirmations Audio creation guide for you, in case you're interested in personalizing your morning affirmation audio by making one for yourself. It walks you through 7 quick steps that will give you your own, personal, morning affirmations audio in less than 30 minutes.